This is a little exercise you can do with triplets. Hope that’s clear. The noteheads are meant to be played/clapped and the sticks without heads are meant to be felt. All the time you’re feeling the triplet feel. You might practise them by repeating them individually until you feel like you’ve got that particular rhythm nailed. 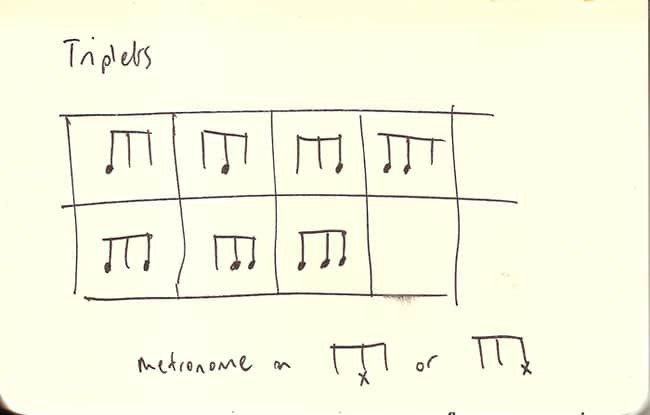 Or practise them with the metronome click on the second or third triplet. That’s a great way to work on making your time stronger, and your rhythmic placement very accurate. Another exercise that’s good for sight-reading/rhythm/concentration practice is to randomly skip through the rhythms in time. E.g., if you labelled the boxes 1-7, then you might go 1 3 4 5 2 7 4 6 3 1 5 2, or whatever. Try it. It makes you look ahead, which is good for reading, good for the brain. Especially try that with the metronome on the 2nd or 3rd triplet.